My first concert, the Kinks at the long-gone Philadelphia Spectrum, was in 1983; the last was this past Friday when Diane and I saw Natalie Merchant at the Keswick Theatre in the Philly suburb of Glenside. In between I’ve been to more shows than I can count. 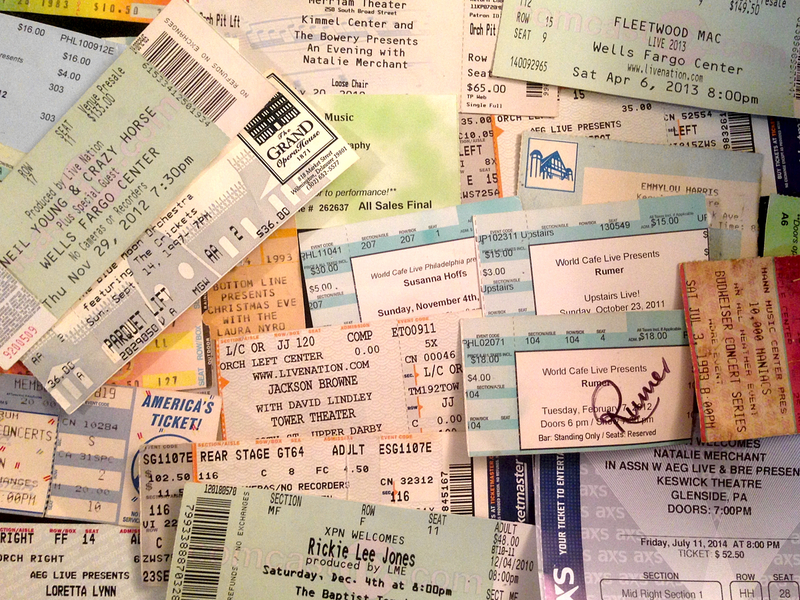 I haven’t saved the ticket stubs from each and every one, as many fans do, and those I’ve kept are generally the result of happenstance, not purpose. They were tossed in drawers and forgotten about until our recent move. First, though, let me return to this past Friday, when we saw Natalie Merchant. Prior to the concert, I participated in a project to commemorate next year’s 20th anniversary of her solo debut, Tigerlily: I stepped in front of a camera and shared my memories of the album as well as my favorite song from it. (I doubt that my contribution will make the final cut, but let’s hope.) As we were getting ready – lighting, sound, etc. – I mentioned to the young woman overseeing the process that I’ve been a Natalie fan since 1986 and The Wishing Chair, the major-label debut of her old group, 10,000 Maniacs. What I didn’t say: time and circumstance kept me from seeing them for years. And years. Which leads me to September 17, 1992, when 10,000 Maniacs performed at the Mann Music Center in Philadelphia as part of an ActionAIDS/World Cafe benefit billed as a “Five-Star Night.” They followed Happy Rhodes, Jeffrey Gaines, Shawn Colvin and Live, an overtly U2-influenced group from nearby York, Pa. Marshall Crenshaw emceed the evening. And Diane scored us great seats. Now, that late-summer’s eve fell 12 days before the release of the group’s Our Time in Eden album; and if any song from it was being played on the radio, well, I may or may not have heard it – my memory is foggy there. All the while, during those fast numbers, Natalie swirled, twirled, whirled and danced with abandon when not at the microphone. I don’t remember her speaking much between songs, save for the band introductions, the “Stockton Gala Days” intro and right before the night’s finale, when blue light bathed the stage. “We’d like to take you back to 1967,” she intoned as the first notes of “To Sir With Love,” Lulu’s pop masterpiece, floated forth. We saw them two more times the next summer at the Mann. Both shows were equally good – my jaw dropped at guitarist Rob Buck’s pyrotechnics during “Don’t Talk” – but it was that first time that comes to mind whenever I think of them in concert. The Philadelphia Inquirer wrote up the show here.